The Purpose for the Pain! 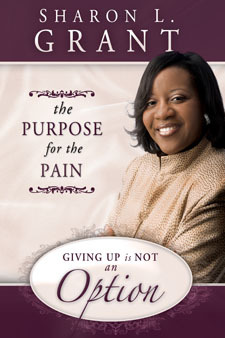 Elder Sharon Grant - Purpose For the Pain, Giving Up Is Not An Option! You can face anything when you decide that giving up is not an option. Pain is the one experience we all want to do without; however, it is the one thing that life delivers to each of us. Unfortunately, many succumb to the pressures of life without fulfilling our purpose. Although life-altering experiences are often hurtful, heart-wrenching, and devastating, you can live a victorious life through the power of God's Word. From her own experiences, Sharon L. Grant guides you through the high and low places of her journey to fulfill God's purpose for her life. Combining her personal testimony with biblical truths, she transitioned into a place of empowerment, confidence, and freedom. We are hard-pressed on every side, yet not crushed; we are perplexed, but not in despair; persecuted, but not forsaken; struck down, but not destroyed-always carrying about in the body the dying of the Lord Jesus, that the life of Jesus also may be manifested in our body (2 Corinthians 4:8-10 NKJV). It's time to enter into God's purpose for your life with strength, peace, and power! Sharon L. Grant is the founder of S.L. Grant Ministries in Dallas, Texas. She is an ordained elder with The Potter's House of Dallas under the leadership of Bishop T.D. Jakes and travels ministering messages of hope and encouragement to those who are brokenhearted, despondent, and discouraged. In July 2008, she was featured on PreachingWoman.com in an article titled "It's Not Over, It's Just Begun!" Click here to Purchase! Elder Sharon Grant is available for speaking engagements. See PreachingWoman.com Speaker's Bureau!